Since the Earth Cruiser back in 1979, Jamis has been producing some of the highest quality bikes out there. They have created some of the most unique and innovative designs in the bike industry, so it's no surprise to us that they continue to make some of the best bikes out there. For riders who are looking for a great all-around road bike, there is the Jamis Xenith Comp. 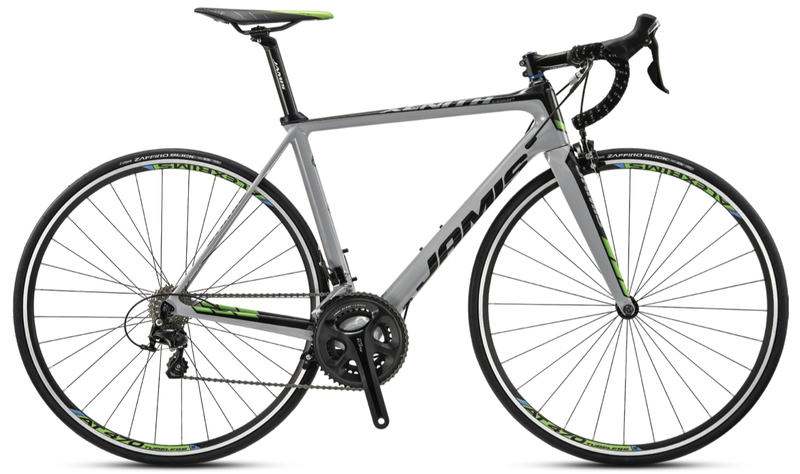 It is a carbon framed, race ready road bike with excellent components. The Xenith Comp uses Jamis Road Dyad Plus T700/FRP monocoque carbon fiber. It has a 1-1/8" to 1.5" tapered headtube and uses an EVO386 carbon bottom bracket shell. ACE internal cable routing keeps the frame looking clean and is compatible with both Di2 and traditional cables. The frame has rider tuned seat stays with a spoiler bridge and oversized asymmetrical chainstays with direct mount brakes. The components are made up of Shimano 105 5800 components. It features Shimano 105 5800 2x11 shifters with a 105 5800 front derailleur and a 105 5800 rear derailleur. The crankset is a Shimano 105 5800 with 50/34 tooth chainrings and is paired with a 105 5800 11-speed cassette with 12-25 tooth gears. This combination gives decent climbing gears while also providing a great selection of mid-range gears to choose from. Alex AT 470 rims provide tubeless compatibility so you can use lower pressures and have fewer puncture flats. FSA Integrated, Tapered 1-1/8" to 1.5"